Enter for a chance to win the Zim’s Max Giveaway! The Zim’s® brand is dedicated to bringing you innovative naturally-based products that live up to their brand promise in every way. Their goal is to improve the lives of consumers with their brands that include over 25 products that are packed with the best of nature and range from skincare to pain relief gels. Zim’s Max-Freeze Roll-On are two products the help with pain relief. Also if you suffer from dry, cracked skin the Zim’s Max Crack Creme Creamy Daytime Formula is a “must have” for your medicine cabinet. 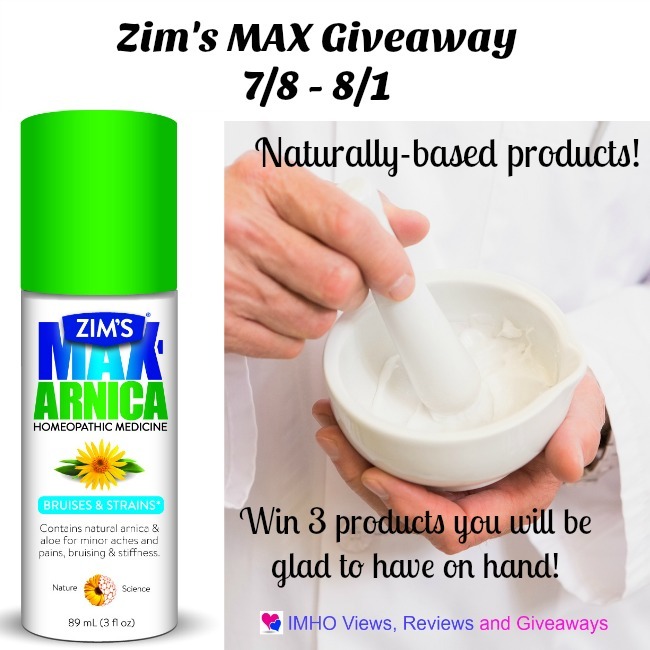 Can’t wait to see if you won, you can purchase the Zim’s Max-Arnica here and also check out their other products. Find Zim’s on Facebook, Twitter , Pinterest , YouTube or visit their website. I have not tried the Crack Creme and would love to!